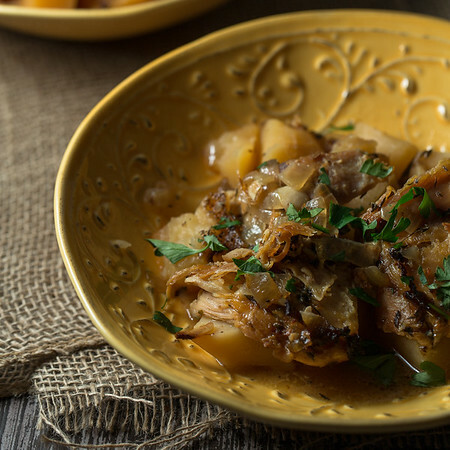 This Slow Cooker Chicken Vesuvio is hearty, comfort food at it’s finest. 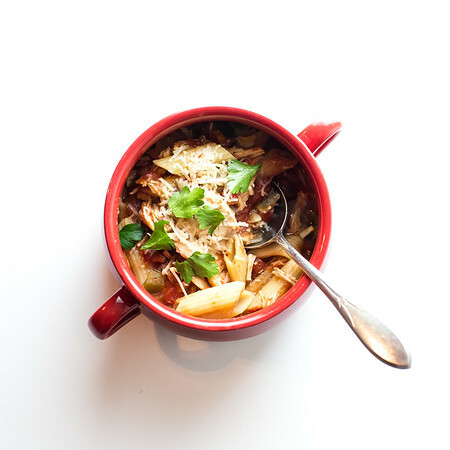 I took a Chicken Vesuvio Recipe and converted it to an easy slow cooker or crockpot dinner! In my quest to cook other things from my slow cooker or crock-pot, I have discovered a new found love for it. Before I had relegated to being used only for soups and an occasional spaghetti sauce, but now I am exploring other options and it is working! I use my slow cooker ever Sunday during the winter. The reason? Because we do our wine tasting (and by wine tasting – I mean we drink the bottle of wine – the whole bottle of wine) on Sunday afternoons around 4. Needless to say, when it comes time to start cooking dinner around five-ish, I am in no mood to start chopping, slicing, and dicing with a large sharp knife. 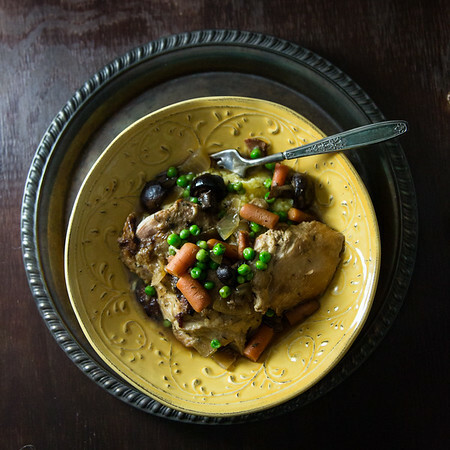 Giada’s Chicken Vesuvio Recipe for the Slow Cooker! Chicken Vesuvio is one of my favorite recipes that I found in Giada’s Family Dinners – and I was in the mood for it’s rustic chicken and potato goodness. Since it was a Sunday, I modified it to cook in my slow cooker. The other change I made was to sub peas for the artichoke hearts that she calls for, simply because I had them in my fridge. If you look closely at the photo, you will be hard pressed to find any peas. That’s because I like my peas barely cooked, so I toss them in frozen during the last hour, however see paragraph one to remind yourself of what I was doing that last hour. Yep. The wine won. I was apparently enjoying my vino a little too much to remember to toss in the peas. But please include them, their nice fresh greenness is the perfect addition to this dish! The other thing is I prefer to make this dish with bone-in, skin on thighs, and even though my freezer inventory list said I had some, I didn’t. So, I used boneless, skinless thighs instead. 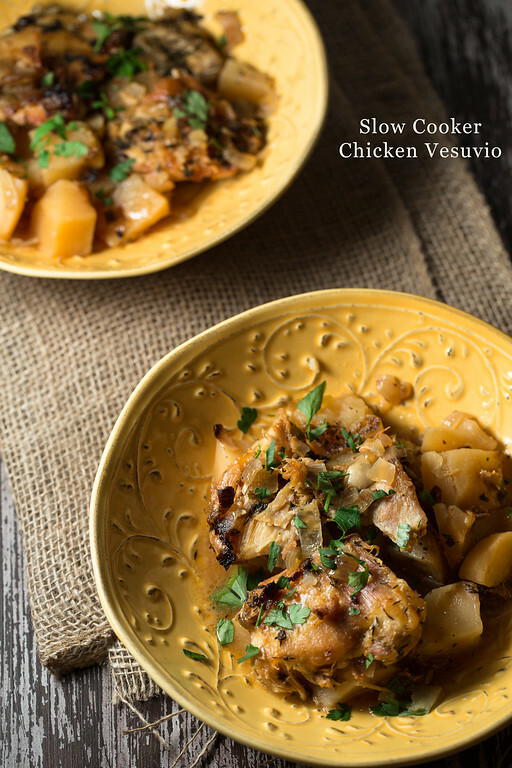 This Slow Cooker Chicken Vesuvio gets loads of flavor from cooking all day! Heat the olive oil in a deep sided skillet over medium high heat. Generously season the chicken on both sides with salt and pepper. Brown the chicken thighs for about 5 minutes on each side until a nice golden brown. You'll know when they are ready to turn when they give away from the pan. You may need to do this in batches. While they are browning, add the potatoes , oregano and thyme to the slow cooker - sprinkle again with some salt and pepper. Top with the chicken as it finishes browning. When all of the chicken is browned, add the white wine to the skillet and scrape to get all the brown bits off the bottom of the pan. Add the chicken broth, the garlic and the onion and cook for a couple of minutes, continuing the scrape the bottom of the pan. Remove from heat and pour this mixture over the chicken and potatoes in the slow cooker. Cover and cook on low 6-8 hours. About an hour before serving, add the frozen green peas. Right before serving, stir in the butter to add a little richness. Serve with fresh parsley sprinkled on top. I can’t wait to dig into this! WOW, I have no words. Making this next week! I don’t know what I like better–how incredibly delicious this sounds or saying the word “vesuvio.” That is just a fun word and I want to make this just so I can tell my kids we are having Vesuvio for dinner. I might even leave out the chicken and let it be a total mystery lol….. I love having new crock pot recipes to try. This looks great. Looks delicious thanks for sharing with Hearth and soul blog hop. pinning and tweeting. That sounds like a great Sunday! Enjoy some wine, and then, this lovely dinner is ready and waiting. I get used to a plan like this! Oh goodness. This sounds awesome. And will not forget the peas! They’re my fav. What a delicious way to use your slow cooker! This chicken dish looks amazing! Thanks Pam – another delicious dish for the crock pot. It’s going to be a good winter. Must remember the most important ingredient – the vino! I really need to get my crock pot out more. I think may have to start with this recipe! It looks and sounds delicious! Like you Pam, I’ve been trying to use my slow cooker more. Your version of the recipe looks tempting as well as easy. Though I don’t have chicken thighs in my freezer, there isn’t enough snow on the ground here to keep me from getting them at the store. Maybe it will be dinner tomorrow? 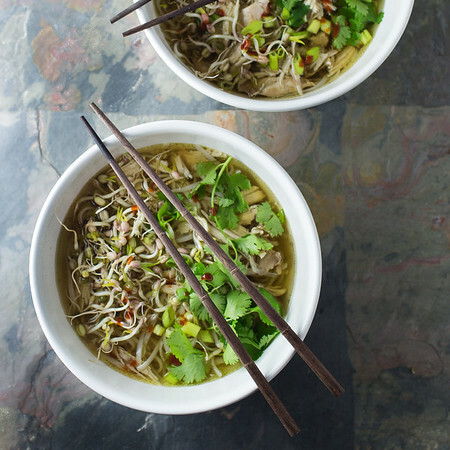 This looks like the perfect thing to have simmering on a cold winter day. I love slow cooker chicken dishes! This sounds so good. I will definitely give it a try. Your Sunday afternoon sounds wonderful and can I say,mom so impressed that you have a freezer inventory. I need to do that. Behold knew.